The Hazard Communication Standard requires chemical manufacturers, importers, and distributors to ensure that all containers of hazardous chemicals they ship are appropriately labeled with the identity of the material, appropriate hazard warnings, and the name and address of the producer or other responsible party. The purpose of the label is to warn about potential danger or significant risk of the container’s contents. Labels are not intended to be either the sole or the most complete source of information regarding the nature or identity of all hazardous chemicals in the workplace. The chemical identity on the label must be keyed to the chemical’s MSDS, which contains more extensive information. OSHA does not have specific requirements relative to how the label must look, nor does it mandate size, shape, or color. Any label that conveys the required information is acceptable. Although you may choose to provide additional information, OSHA’s requirements are limited to that required to convey the hazards to users. Other data regarding protective measures and first aid are included on the MSDS or covered during training. In evaluating the effectiveness of labels, OSHA has found that the more detail that appears on a label, the less likely it is that users will read and act on the information. All containers of hazardous chemicals must be labeled. A container is defined as any bag, barrel, bottle, box, can, drum, reaction vessel, or storage tank that contains a hazardous chemical. This definition does not include pipes or piping systems, nor engines, fuel tanks, or other operating systems in a vehicle. There are currently many marking systems in use. There is no preferred or mandated system. Any label that conveys the required information clearly and in English is acceptable, as well as the label provided by the supplier that is already on the container. The best programs utilize a simple marking system that is readily recognizable and easily understood. Any worker should be able to quickly identify the general hazard of a material and the severity of the hazard by glancing at the label. The primary information to be obtained from a label is an identity for the material and appropriate hazard warning. The identity is any term that appears on the label, the MSDS, and the list of chemicals — thus linking these three sources of information. § The identity used by the supplier may be a common or trade name (“Black Magic Formula”), or a chemical name (1,1,1,-trichloroethane) — as long as the term used is also used on the MSDS for the particular chemical, and on the chemical inventory list. § The hazard warning can be any words, pictures, or symbols that convey the physical and health hazards of the chemical (“flammable,” “causes lung damage”). § Other information, such as precautionary measures (“do not use near open flame”), may be included on the label, but this information is provided voluntarily and is not required. Labels must be legible and prominently displayed. There are no specific requirements for size or color; but to be easily recognized and understood, it’s a good practice to keep labels uniform throughout the facility. 1. If you break down the received quantity of chemical into smaller containers, you need to label these containers. 2. Labels that fall off or become unreadable must be replaced. 3. Relabeling incoming containers for a company-wide uniform labeling system. This also makes training easier because you only need to explain one system of labels. OSHA recommends that if you are using an in-plant labeling system for uniformity, allow the incoming container labels to remain on the original containers rather than removing them when in-plant labels are added. Many times a solid metal is exempted from labeling because it is considered an article, based on its downstream use. However, if the end use of the metal results in hazardous chemical exposure to the employees working with it, then it is not an article and must be labeled. The label information should indicate the chemical hazards released when the metal is worked on. The label should be sent to the customer at the time of the initial shipment, and need not be included with subsequent shipments to the same purchaser unless the information on the label changes. The label can be sent with the initial shipment or it can be sent with the MSDS. Fire extinguishers containing compressed gas or hazardous chemicals are required to be labeled under the HCS. A compressed gas is defined as any material or mixture having a pressure of 40 pounds per square inch or greater and is considered a physical hazard. The fire extinguisher manufacturer will attach labels to its fire extinguishers identifying the hazards of the contents. Machinery found in the workplace that may contain hazardous chemicals does not fall under the definition of a container; therefore, the machine components do not have to be labeled under HCS. If there is the potential for exposure to the hazardous chemicals associated with these machines, the article exemption does not apply, and these chemicals would be covered by the rule. Process equipment which incorporates containers, such as mixers and blenders, must be labeled. You may use signs, placards, process sheets, batch tickets, operating procedures, or other such written materials in lieu of affixing labels to individual stationary process containers, as long as the alternative method identifies the containers to which it is applicable and conveys the information required by the rule. When an employee fills a portable container with a chemical from a labeled container and uses the substance within one work shift, the temporary-use container does not have to be labeled. However, problems arise when the shift ends and there is material left in the portable container. Many companies require that all containers, including temporary-use containers, be labeled to avoid people using chemicals from unlabeled containers. You may want to designate and label small portable containers and reuse them for the same chemical to avoid a worker mistaking one chemical solution for another. § Any pesticide, labeled under the Federal Insecticide, Fungicide, and Rodenticide Act. § Any chemical substance or mixture labeled under the Toxic Substances Control Act. § Any food, food additive, color additive, drug, cosmetic, or medical or veterinary device labeled under the Federal Food, Drug, and Cosmetic Act or the Virus-Serum-Toxin Act. § Any beverage alcohols, wine or beer intended for nonindustrial use, labeled under the Federal Alcohol Administration Act. § Agricultural or vegetable seed treated with pesticides and labeled under the Federal Seed Act. § Any consumer product or hazardous substance, labeled under the Consumer Product Safety Act. The Hazardous Materials Identification System (HMIS®III) is a labeling system developed by the National Paints and Coatings Association to help its member employers comply with labeling requirements of the Hazard Communication Standard. 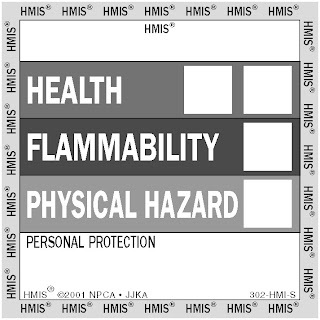 HMIS®III is a distinctive label using a numerical hazard rating system and color-coded bars that give data on the health, flammability, and physical hazards of a chemical. Personal protective equipment information is conveyed with distinct icons attached to the label. Used with the associated training program, the HMIS labeling system allows workers to identify, at a glance, the type and degrees of hazard associated with each labeled product. The National Fire Protection Association’s (NFPA) labeling system is intended to provide basic hazard information to emergency personnel so they can better evaluate what fire fighting techniques to employ. 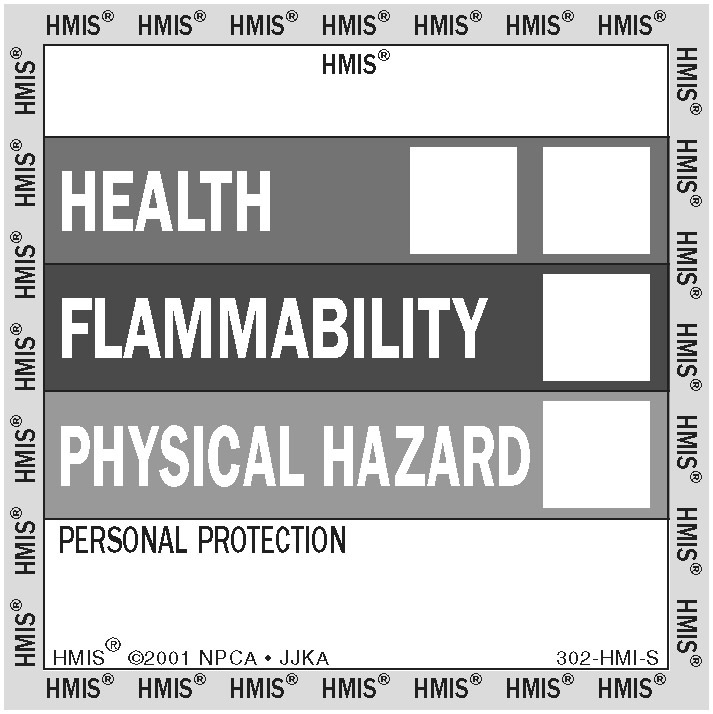 NFPA labels are also used as an in-plant labeling system. Although the system does not provide detailed hazard information, it is acceptable as long as training regarding the system is conducted and MSDSs are available to provide the required detailed chemical hazard information. The NFPA square-on-end label is divided into four colored squares (red-flammability, blue-health, yellow-reactivity, and white-special) with a hazard rating number ranging from “zero (0) - no special hazard” to “four (4) - severe hazard” in each square. 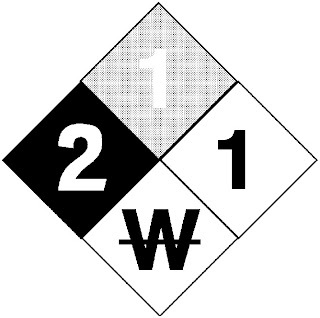 The usual symbol for alerting fire fighting personnel to the possible hazard of using water is the letter W with a line through the center placed in the white square. Emergency personnel prefer this system because they can tell from a distance what precautions to take when approaching a container or handling a fire. However, this marking system should not be used on a shipping label because it does not provide adequate hazard warning details when it is used apart from the MSDS. Where the shipping container is a tank truck, rail car, similar vehicle, the appropriate label may be posted on the outside of the vehicle or attached to the shipping papers. DOT placards are intended to provide protection for those involved in transportation, while OSHA labels are intended to protect the employees of the downstream recipient. A label may not be shipped separately, even prior to shipment of the hazardous chemical, since to do so defeats the purpose of providing an immediate hazard warning. Mailing labels directly to purchasers bypasses employees involved in transporting and handling the hazardous chemical. Packages, containers, rail cars, or similar vessels holding hazardous materials are required to be marked, placarded, or labeled according to hazardous materials regulations (HMR). These containers must retain the labels until the hazardous materials are removed. This requirement comes from §1910.1201, Retention of DOT Markings, Placards, and Labels, an OSHA rule related to the Hazard Communication Standard. The rule requires employers who receive hazardous materials to retain markings and any other information specified by HMR until the materials have been removed so they no longer pose a health or safety risk. It applies primarily to bulk packages (defined by the Department of Transportation (DOT) as containers with a capacity of more than 119 gallons), but also applies to non-bulk receptacles that are repackaged and reshipped. The HCS requires that labels, tags, and markings be attached in a way that does not conflict with the HMR. Consequently, the HCS warning labels, tags, or markings do not appear on the outer packagings of combination packagings (e.g. bottles in a box). The inner packagings are required to be labeled according to HCS guidelines, while the outside packaging is marked or labeled according to HMR guidelines. Without restricting the regulation to bulk packaging, employers would be faced with confusing, redundant, and sometimes inconsistent labeling requirements between DOT and OSHA. This requirement applies only to the employer that receives the hazardous materials — not the person responsible for transporting it — unless the materials are still controlled by the transporter at the final destination when it is out of transport. If you are purchasing and using hazardous chemicals, rather than producing or distributing them, you will primarily be concerned with ensuring that every purchased container is labeled. The most important thing to remember is that this is a continuing duty — all in-plant containers of hazardous chemicals must always be labeled. Since labels can come off, information covered with product or otherwise made unreadable, it’s essential to designate someone to be responsible for ensuring that all containers are labeled, that labels are readable, and that newly purchased materials are checked for labels prior to use. 5. Procedures to review and update label information when necessary. I have a tote which is labeled a flammable under DOT standards but under the osha Standard is a combustible. Am I allowed to remove the DOT placard from the tote after we receive it and put it in our shop?